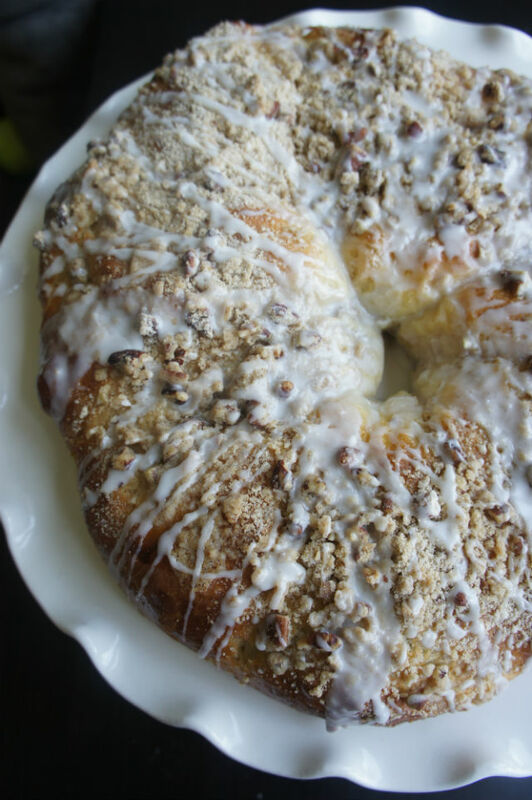 There is just something about store-bought coffee cake, especially Entenmann’s that is irrestible. I cannot control myself when it is around. Several times in the past few years my husband has brought one home, in an attempt to make me smile. And of course I immediately yelled at him for buying it. Then I ate the whole thing in one sitting. What can I say – we all have our weaknesses. 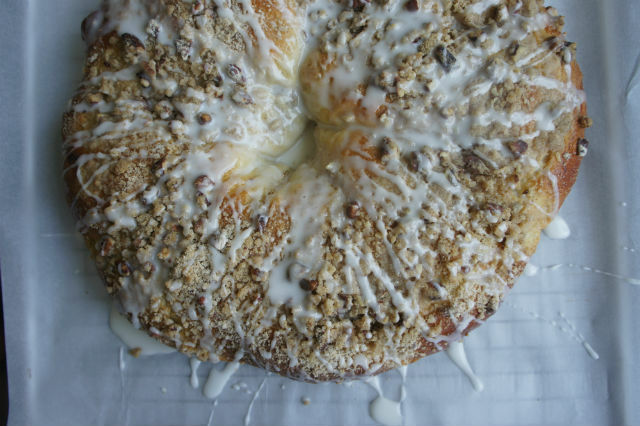 My dear friend Danielle recently suggested I should try my hand at mashing up my classic challah with a coffee cake. I nodded my head in enthusiastic agreement and got to work right away. When my dad tasted the new flavor he said, “hmmm – tasted just like Entenmann’s!” I can’t think of a better compliment. 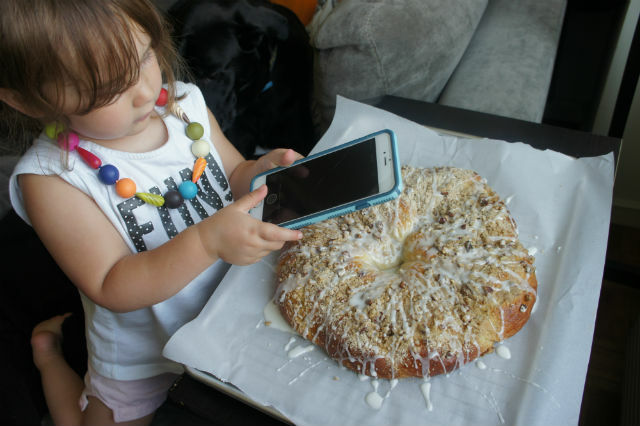 Yes, even my daughter enjoyed the new flavor, but first she needed to snap a few shots. In a small bowl place yeast, 1 tsp sugar and lukewarm water. Allow to sit around 5-10 minutes, until it becomes foamy on top. In a large bowl or stand mixer fitted with whisk attachment, mix together 1 1/2 cups flour, salt, and sugar. After the water-yeast mixture has become foamy, add to flour mixture along with oil and vanilla. Mix thoroughly. Add another 1-1 ½ cups flour and then remove from bowl and place on a floured surface. Knead remaining flour into dough, continuing to knead for around 10 minutes (or however long your hands will last).Don’t add more flour then the dough needs – the less flour, the lighter the dough. To make the crumb topping: combine flour, sugar, cinnamon, pecans and sea salt in a large bowl. Add cold butter or margarine and mix using a pastry cutter until mixture resembles crumbles. Refrigerate until ready to use. After the challah is done rising, split the dough evenly in half. Divide each half into three pieces. Roll each piece into a snake and then flatten. Sprinkle crumb topping inside, then pinch sides up to close. Gently roll again to seal in filling. Repeat with all pieces and then braid, forming into a circle and pinching together each end of the braid.